if you read my post on italian wedding soup, you already know how much i love soup. i’ll spare you too much repetition, but in short, i really really adore soup. so, when week two of my one-new-dinner-a-week challenge for 2012 rolled around + it was a gray, rainy day, i knew that the dinner should be soup. but what kind? after some internet browsing, i settled on pasta e fagioli, a traditional italian pasta + bean soup with a tomato broth base. it’s a soup i love, yet i had never made it myself before, so i figured it was time to give it a try. after reading the recipe, i upped the herbs + spices a bit, hoping for a soup that had a great depth + flavor + fantastically, that’s exactly what i got. let me tell you, this soup is delicious! this type of unexpectedly fabulous meal makes me so thrilled that i gave myself the one-new-dinner-a-week challenge this year, as i don’t know if i would’ve tried this recipe otherwise – i probably would’ve continued buying tasty pasta e fagioli soup from the local cafe, not thinking to make it myself. this soup is wonderfully savory, with a great variety in flavors + textures from the ingredients. its flavor is complex without being fussy, + the soup itself is simple without being boring. it’s a big bowl of wonderful, especially delightful when served with fresh homemade bread. when my husband, not a huge soup fan, ate an entire bowl of it for dinner, i knew we had a big winner. a quick note: this soup is not vegetarian, as it has bacon + chicken stock as ingredients. however, fear not, my vegetarian friends — it can easily be made vegetarian by omitting the bacon, adding a little salt + liquid smoke to mimic the bacon, substituting olive oil or butter for the bacon fat + vegetable stock for the chicken stock. thanks to vegetarian pal lesley for the substitution ideas! in a dutch oven or stockpot, cook bacon over medium heat until browned + crisp, stirring occasionally, about 8 minutes. add onion, carrots + celery; cook until vegetables are soft, about 5 minutes. add garlic + rosemary; cook until fragrant, 1 minute. season with salt + pepper to taste. stir in tomato paste, beans, red pepper flakes, + broth. bring to a boil, reduce heat, + simmer, partially covered, until soup has thickened slightly, about 20 minutes. lightly mash some of the beans in the pot to give the soup body. add pasta to the pot; cook until al dente, about 8 minutes (may vary according to your pasta). season to taste, if needed, with additional salt + pepper. to serve, ladle soup into bowls; sprinkle with parmesan + parsley, if desired. I’m loving it that you are trying a new recipe each week (especially since I get to see the yummy end-results!). I’m wishing I had a bowl of this today–it’s 20 degrees (!) where I am, so I could certainly use some of this warm, comforting soup. look fantastic! Perfect time of year for this! Hope you’re well!! thanks, alison- i’m doing great! + i agree – this gray, rainy weather we’ve been having, mixed in with some seriously chilly days, is just perfect for soup. Looks fabulous. What a pretty presentation. I’m adding this one to the list of recipes I want to try. Thanks for sharing the recipe. I tell ya, Liquid Smoke is magic. The smoke flavor is the most important part of bacon, as far as I’m concerned. I use it to flavor beans as well as soups. believe it or not, i’ve actually never used it – i wish i had known about it when i was vegetarian, as it would’ve probably helped with a lot of recipes. it’s on my to-buy list now — it’ll be great if i’m cooking for vegetarians, or just want to have a meat-free meal myself. thanks for helping with the veg substitutions! I love pasta e fagioli and yours looks great. I am a vegetarian so I will try adding the liquid smoke thanks for that tip. you’re very welcome + i’m so glad that the vegetarian substitutions were helpful for you. can’t wait to hear how it turns out! Ooh, this looks really delicious. My Italian hubby will love this! And I think my Italian Mother-in-law will be mighty impressed haha. Also, I’m a big fan of liquid smoke. I use it in several dishes, including my baked beans with bacon. I may have to add a dash for added flavor. Great idea for substitutions as well, Amy! i’m thinking that i’ve been missing out by not experimenting with liquid smoke – i’m hearing so many good things about it. i’m definitely buying ASAP + trying it out in a couple recipes. hope that you, your hubby + your mother-in-law love this soup! Amy that is one good looking bowl of soup, wish I had some right now especially since I am hungry! This sounds delicious. My hubby is also not a fan of soup. Poor guy, because I can’t get enough of it! it is, it is! =) so glad that you can use gluten-free pasta to make it work for you. let me know how it turns out! This looks like the ultimate comfort food. It’s chilly right now and this looks like it will warm you up in a jiffy! Thanks for posting. How long do you think this will keep for? hi joanna, i did a quick search + it looks like this soup will keep for about a week, in an airtight container + refrigerated. it only lasted 3 days here before it was entirely gone, though! =) it is definitely a perfect comfort food, especially for a chilly day. I too LOVE soups! I’ve made a lot this season. They usually freeze well too. I’ve never made a Pasta e Fagioli before, perhaps I should! YUM! i grew up eating this soup! though my dad’s side of the family is Italian, it is actually my German grandmother who makes the best i’ve ever had. she is the queen of soup, and i love soup about as much as you do! my all time favorite is a tomato/beef broth based mushroom barley soup. thanks for reminding me to make this again soon. ooh, if you make the mushroom barley soup, pleeease put it on your blog. i love mushrooms, barley AND tomatoes, so i’m sure i would love it. woohoo for soup! Yea! Another great recipe for something to cook in my new dutch oven. I am sure it is delicious. I’m glad my husband loves soup as much as I do. I agree this would be great on a cold and rainy winter day. Oh Amy! This looks so good, so hearty and so comforting. Perfect winter soup! thanks so much, claire. i agree – it’s a perfect cold weather soup – so comforting + warming! woohoo, glad to hear that it’s another thing for you to make in your fabulous new dutch oven. sounds like you’re definitely going to get a ton of use out of it! I really love all of the homemade – making things at home that you would ordinarily buy – recipes you’ve been posting. I never would have thought to make pasta e fagioli at home, assuming it would be much too complicated, but this has definitely changed my mind! aww, thanks leandra! you’ll definitely have to give this soup a try – it’s definitely as delicious as the store-bought version, if not better! Pasta e Fagioli is my favorite soup! It’s my comfort food. I always crave it when I’m sick, tired, or cold. Your recipe looks delicious! i’m the same way – i always crave soup when i’m under the weather or tired, too – it’s the perfect pick-me-up. =) thanks for your kind words! Looking good! You nailed the right noodle. that’s serious high praise coming from you, arguably the king of noodles – thank you so much! Yum!! Looks great! Of course, I think any recipe adapted from Martha would be great. You can’t go wrong! i agree – i have had tons of success with martha’s recipes. that’s become my first stop when i’m looking for a new recipe! I could eat soup every day. I even order hot soup on summer days! This recipe looks fantastic. 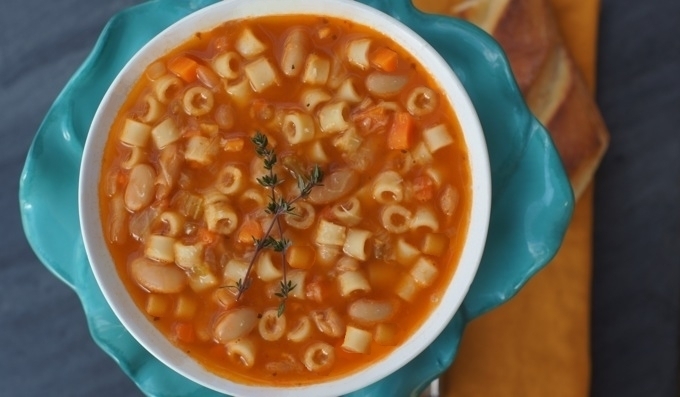 I’ve actually never had pasta e fagioli, but it sounds (and looks!) like I’m missing out. i’m the same way! i try to make more chilled soups in the summer, but i can’t deny that hot soups are really what i prefer, even on the hottest of days. you’ll definitely have to give this a try – it’s wonderfully hearty + full of flavor. I would love this soup today….freeeeezing over here in Boston. i hope it turns out great for you + you like it — i’ve made it twice in the last 7 days, so it’s definitely a favorite around here lately! Hi Amy, I’ve just stopped by your blog and it looks fab! welcome, katia! i always love having new blog readers. =) i absolutely love england + now that i know pasta e fagioli is popular there, i love it even more! This is on my to-make-list. that’s awesome, lou! i can’t wait to hear how it turns out!